These policies sound encouraging, feminist, and promising: on the surface, this measure would ensure more female representation. But the underlying effect is unlikely to render true gender parity. Working towards women’s representation is far more multifaceted, complex, and rooted in social culture than just instating quotas would assume, making it problematic and even counterproductive to use them as a measure for gender equality. They fail to address underlying causes of female under-representation, undermine the legitimacy of women in the workplace, and promote a universal female experience. Consequently, quotas act as a mask or a surface-level shortcut to solving a problem that is too deeply rooted in our social history. On paper, women have the same rights as men: they can vote, run for office, get a higher education, own property, and enter the workforce in any field desired. This, of course, was not always the case: women have had to march, protest, and suffer through imprisonment and hunger strikes to gain the same rights as their male counterparts. Yet, underrepresentation of women in high-level political and business positions persists, despite the elimination of these structural barriers. The truth is that the barriers that excluded women from politics and the workplace were kept in place by old, deeply-rooted gender norms and biases against women. Thus, the elimination of legislated barriers does not entail or presuppose the elimination of these entrenched attitudes. The sexism that portrays women as irrational, emotional, and untrustworthy is what discourages their election to office, or plays against them in the competition for high-level business positions. Quotas ignore this nuance, instead ascribing a concrete, structural measure as a solution to an abstract, social problem. Though the top-down quota will, on the surface, result in a greater presence of women in these positions, it will not necessarily change the social constructs and attitudes that place women at a disadvantage every day. In fact, quotas have the potential to worsen them by creating divides, doubt and resentment (and unstable teams) where they are implemented. 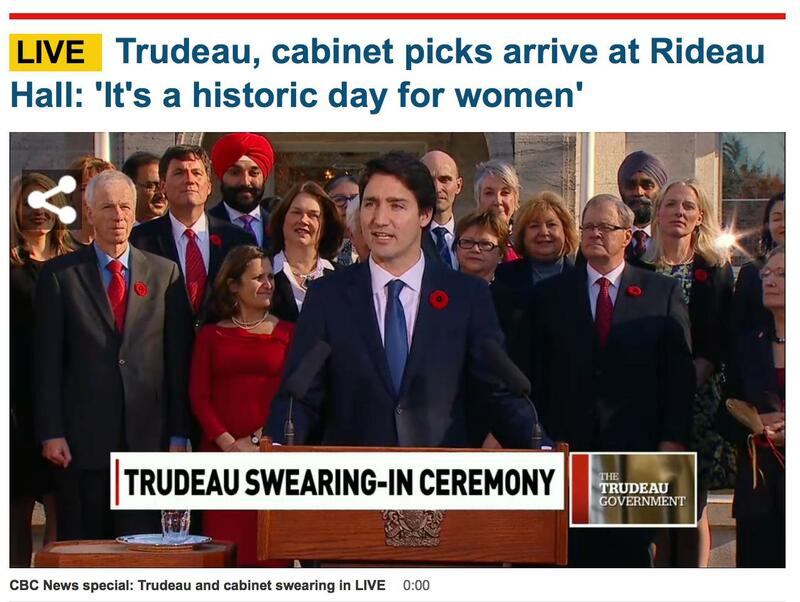 Justin Trudeau and his gender balanced cabinet in 2015. When Justin Trudeau was elected as Prime Minister of Canada in 2015, he made the decision to select a gender-balanced cabinet. This was far from uncontested. Within days, those opposing such a measure were making themselves heard. Journalist Andrew Coyne of the National Post titled an opinion piece, “Trudeau cabinet should be based on merit, not gender.” The Conservative Party came out as staunchly opposed to such measures, with Kellie Leitch affirming that a woman is only heard in politics when “you earn your place at the table” rather than being handed it. Even without quotas, women’s qualifications are often questioned relative to their male counterparts. One of the biggest issues with quotas is that they further create doubts around women’s qualifications for a position. Women in quota positions are, like Leitch describes, considered to have been handed their job, and consequently, their achievements are considered as a product of the quota rather than their merit. Beyond the obvious harm to women’s reputations, a measure like this has the detrimental effect of tokenising women. Because quotas “force hiring women on a short timeframe,” the wrong, inexperienced, under-qualified women are selected. This is not to say that experienced, capable women in those fields do not exist, but quotas represent an inconvenience companies and institutions are in a hurry to comply with. Not only does this harm the overall performance of a business, but it harms women’s reputation, thereby turning them into space-fillers. As a result, women are often not chosen for their qualifications, respected, or given equal influence, and essentially become a game-piece that is only there to fulfill a requirement. Tory leader Rona Ambrose’s words summarise this best: “[quotas] make some of the women feel like that’s the only reason they got the job.” Again, this is counterproductive to remedying the disadvantaging social constructs surrounding women and to achieving actual gender equality in the workplace. Gender quotas are particularly problematic in the political sphere because they assume there is a universal female experience, and that any woman can represent all women. It also assumes that gender dominates women’s identity and reunites all women, rather than seeing identity as a combination of things like gender, race, class, ability, or religion and thus failing to acknowledge that there is a diversity of women with different experiences, races, classes, ability, or sexuality. A woman is therefore not guaranteed to feel represented by another woman running for or holding public office, because there are other factors that influence a woman’s vote choice. Theresa May, for example, is an older, white woman, who is not particularly known for her feminist rhetoric of policy. It would be unrealistic for a young woman of colour from the middle class to look up to or vote for May. It is therefore crucial to note that not all women fight for women’s rights, nor do they have the ability to represent all women. Quotas glaze over this fact, assuming that a certain percentage of women in high-ranking positions is sufficient to make all women feel represented. What quotas achieve is surface-level, artificial equality, rather than true, substantive equality. The quota ends up representing only one kind of woman, which cannot be considered true gender equality. It therefore becomes clear that such a structural, “fast-track” policy cannot fix what is the product of hundreds of years of social conditioning and oppression of women. Gender parity must originate from the bottom up, within society, because that is where the issue is rooted. The attitudes that portray women as irrational, emotional, and unsuited for leadership are what places them at a disadvantage. Quotas only gloss over these root causes, harm hardworking women’s reputation, and lump them all in to the same, tokenised category. They effectively do very little to create a change in these attitudes. Instead, Rona Ambrose asserts that “when you create an environment where women can succeed, then you don’t need quotas.” This is exactly where the energy should be focused: attacking the problem from the bottom up, actively dismantling the parts of our social attitudes that feed the lingering sexism that disadvantages women in the first place.